SPOKANE, Wash. – Gonzaga University supporters everywhere united on Feb. 11 to celebrate “Gonzaga Will” on the fifth annual Gonzaga Day. Fans cheered the Zags’ basketball teams to victories over Saint Mary’s as the women won 59-58 in the Kennel and the No. 1-ranked and undefeated men won 74-64 in Moraga, California. At halftime of the women’s game, a sold-out crowd watched a student-driven program in which Gonzaga Student Body Association President Caleb Dawson discussed the power of Gonzaga Will. A year and a half ago, Gonzaga Will: The Campaign for Our Future was launched with a goal of raising $250 million. Dawson shared with the crowd that more than 7,000 donors from the Spokane area have donated to the campaign, contributing to the growth of Gonzaga’s endowment and scholarship programs. In total, $240 million has been raised to date from more than 34,000 donors. The halftime program underscored the collective power of Zag Nation and the impact of benefactors in helping students realize their dream of a Gonzaga education. Together with Gonzaga’s commitment to increase access to higher education, these gifts to scholarships make a Gonzaga education possible. More than 2,000 Gonzaga alumni gathered at more than 30 chapter events (Spokane to Seattle, Calgary to Tokyo) to watch the men reach a 26-0 record in an ESPN College GameDay primetime national broadcast. The Zags, now 28-0, sport the longest win streak in the nation and in program history; the 2014-15 team won 22 straight games. For the first time, this year’s Gonzaga Day included a 72-hour Gonzaga Day Giving Challenge. For three days, Zags from 39 states and Canada stepped up to support scholarships. 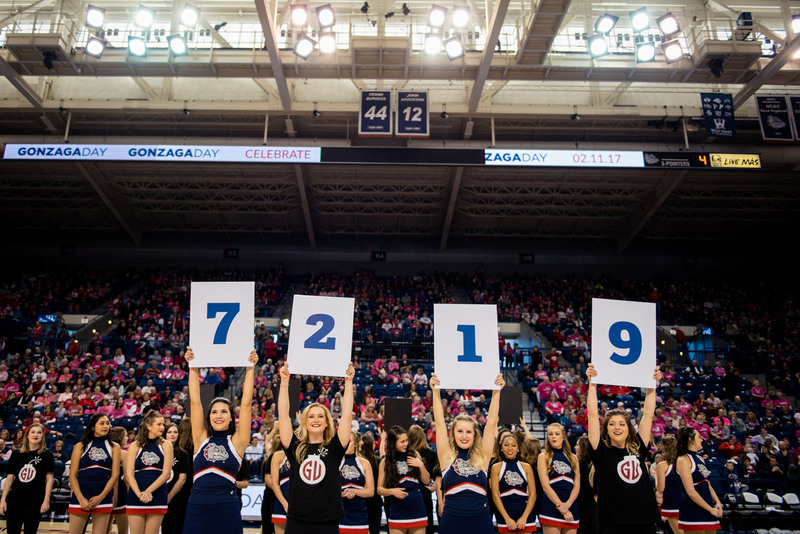 Zags raised more than $156,000; with match dollars included, more than $250,000 was raised – the most in school history for a giving challenge. These dollars will result in more than 100 scholarships for students, now and in the future. Gonzaga Day 2017 also was a worldwide social media event with 913 shares of #GonzagaDay resulting in nearly $1,000 going toward scholarships. “I want to say a heartfelt thank you. Thank you for all that you do for this incredible institution. Thank you for supporting our students and for believing in our Jesuit mission and what we will do now and in the future,” he said. View photos and videos from this year’s celebration.